Early testers of Google Glass are now being offered the option to upgrade to the newest model of Google Glass free of charge. Google recently sent out emails alerting early adopters of the offer, but says that it’s only valid until February 5. The second version of Google Glass made its debut in October and includes an earbud, which will work perfectly with the new Google Glass Play Music application, and the new model will also eventually support prescription lenses. Overall, though, it seems to be really similar to the first version that Google launched to Explorers originally. 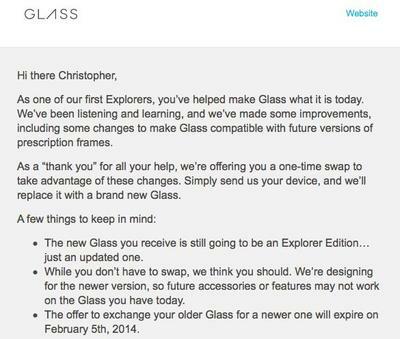 Google only requires that you send in your old pair of Google Glass, but it doesn’t say how long it will take for a replacement to arrive. We have a feeling the first version will one day fetch a pretty penny at auction houses, but the choice is yours.